What does the Attic do? Avid editing systems allow you to organise your edits and clips into 'Bins.' If these bins become damaged or content accidently deleted from it then thsi can cause and issue. 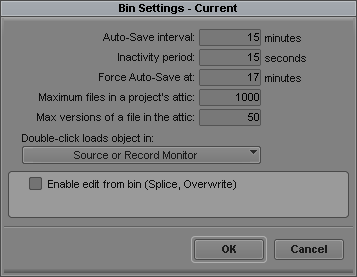 Avid saves a copy of your opened bins and after a fixed period of time (usually every 15mins by deafult) the bin is saved into a specific location, the Attic. On standalone Avid systems the Avid Attic is usually found in one location. 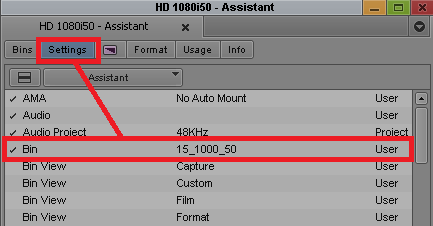 There is a folder inside the Avid Attic folder that corresponds to the name of the project: ‘HD1080i50’ for example. Inside this folder is a folder called ‘Bins’, in which there is another folder for each bin that has been auto-saved. In our example folder, ’01 Day One Rushes’, there are four back-up copies of the ’01 Day One Rushes’ bin. The bin copies are missing their .avb extension, and instead get an automatically incrementing number. The bin with the highest number is the most recently saved bin. How do I control the Attic? You Media Composer user settings control when bins are backed up, in particular the Bin Settings. This tells the system how frequently an auto-save attempt should be made. It will try to save after this interval, but will only perform the actual save when there has been an idle or, Inactivity Period. This is the length of time, in seconds, that has to pass with no user interaction before the auto-save starts. This is the total number of files to store in the Attic. The default is 1000 files. It can be used to prevent too many files from filling the Attic folder and may need to be increased on systems with a lower default figure. This setting prevents filling the Attic with too many copies of one bin, at the risk of losing the others. The default is 50 copies. How do I restore a bin from the Attic? Remove the bin that you want to replace from the Project’s folder (or make sure that it is closed). Copy the bin from the Attic to the Project folder you are working in. Rename the bin, adding the .avb extension to ensure the bin can be seen. Internally, Avid systems track bins not by their file names but on an unique internal identifier, a Bin-ID. The Bin-ID is assigned to the bin when the bin is created and it never changes and is always unique. Each copy of your bin the attic will retain the Bin-ID of the original bin, and Avid Media Composer will not allow two bins with the same ID to be open in the same project at the same time. This is why you are asked to close or remove the off ending bin from the project folder first. It is permissible to leave the original bin in the Project folder as long as it is not open.